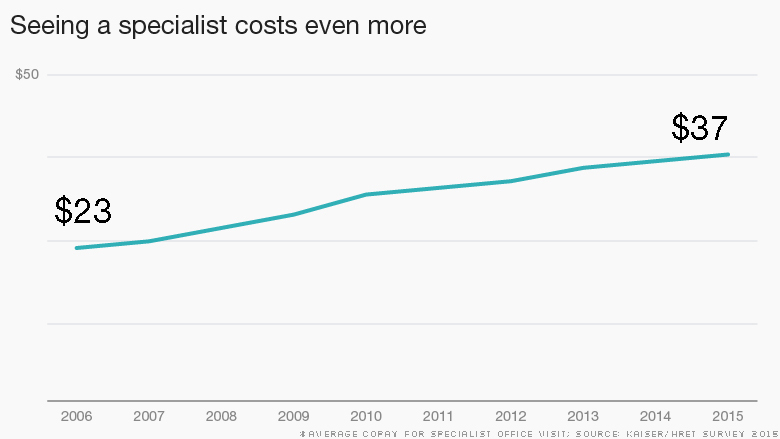 It sure doesn't feel like health care costs are growing at record-low rates. 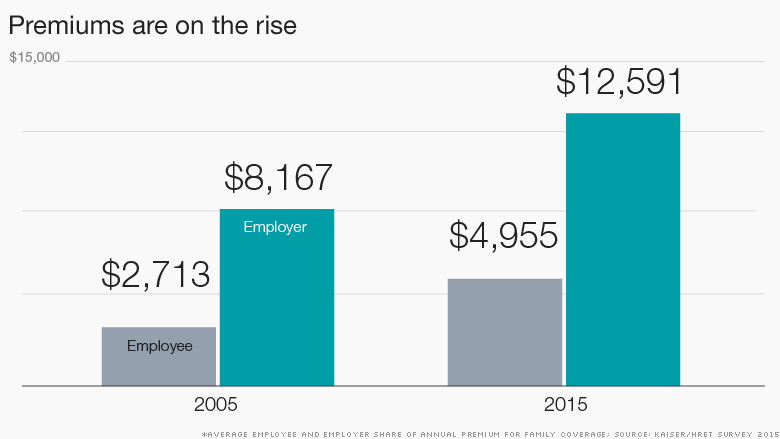 Overall, average annual premiums for family coverage hit $17,545 in 2015, up from $10,880 a decade earlier. But workers bore more of the brunt, with their contribution rising to $4,955, up 83% from 2005. The share employers pay, meanwhile, rose only 54% to $12,591. Premiums for single coverage hit $6,251, up from $4,024 a decade ago. Workers are paying $1,071, up 76% from 2005. Employers are paying $5,180, or 52% more. Share your story: Are your deductibles going up? The launch of the Obamacare exchanges in 2014, however, has virtually no impact on the work-based insurance market since they cover two separate populations. The exchanges are targeted at individuals, most of whom don't have access to health coverage at a job. But other Obamacare provisions, particularly the looming Cadillac tax in 2018, have prompted employers to keep premium increases in check, while raising out-of-pocket costs. The rise in health care costs is hitting workers particularly hard because it's growing much faster than wages. Since 2010, the workers' share of premiums have risen more than twice as fast as wages. "Deductibles are rising a little bit every year -- almost $100 a year -- and then that really adds up, in combination with flat wages," said Drew Altman, the foundation's president. "If wages were keeping up with the growth of cost sharing, it wouldn't be a big a deal for people. But the pain level is significant. It really affects family budgets because their wages aren't rising at the same time." More employees have to satisfy an annual deductible before their health insurance even kicks in. 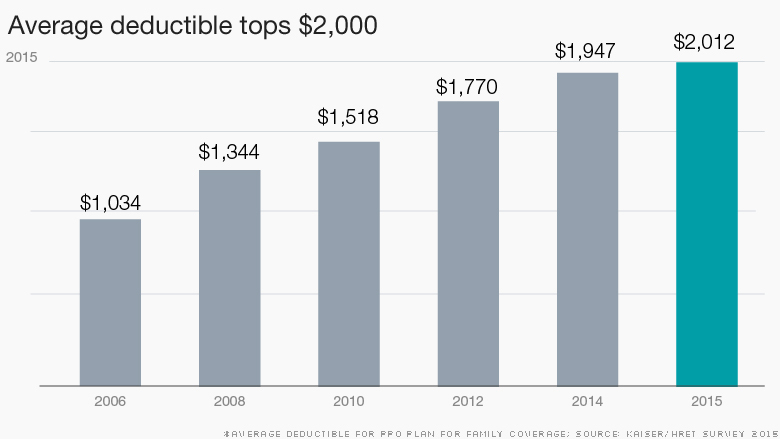 Some 81% of firms have deductibles now, up from 55% in 2006. And those deductibles are climbing ever steeper. Some 46% of workers with single coverage face deductibles of at least $1,000, up from 10% in 2006. Some 19% are paying more than $2,000 a year, up from 3% in 2006. Nearly one in four companies offer only a high-deductible plan to their staff. Companies are raising deductibles so swiftly because it's one of the easier ways to restrain the growth in premiums, which they pay a portion of. 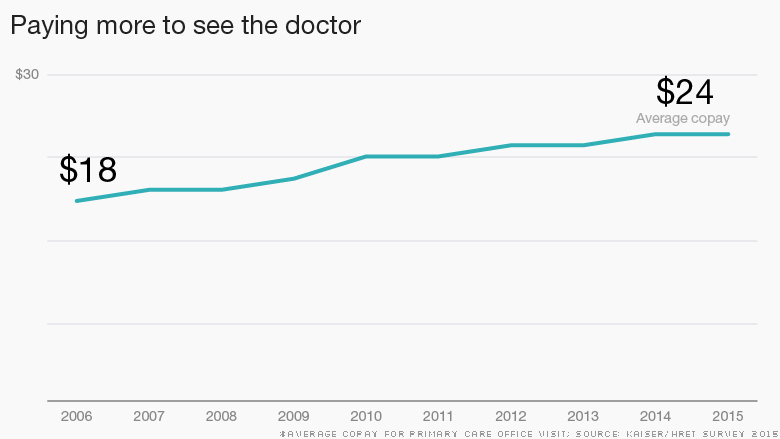 People are paying one-third more at the doctor, on average, than they were in 2006. Some 23% of workers pay co-insurance, which is a percentage of the bill, instead of flat fee. The average co-insurance rate is 18%, where it's been since 2009. Seeing a specialist will cost an even prettier penny, with the average co-payment hitting $37 in 2015. About a quarter of workers pay co-insurance to see the doctor. That share has stayed relatively flat in recent years at 19%. 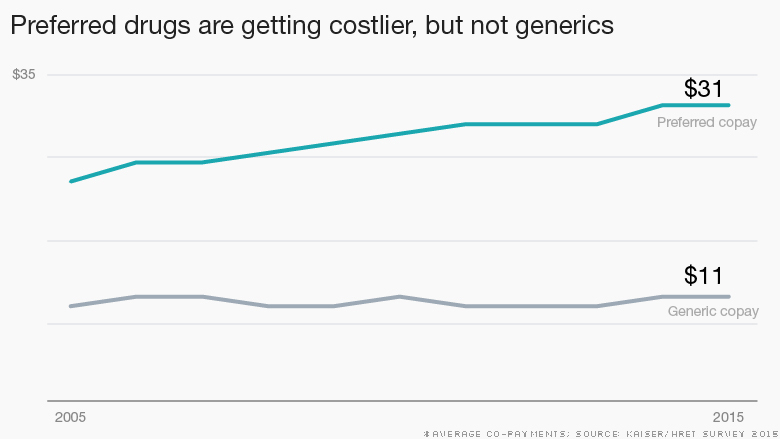 While generic drug prices haven't risen much, the cost of preferred drugs has steadily climbed in recent years. What's more, many employers are adding more pricing tiers to their plans. So a brand name drug without a generic equivalent might cost $31, on average. But if it has a generic version, the brand name drug might cost $54, on average. Insurers are also adding a fourth tier for certain complex medicines or so-called "lifestyle drugs," such as weight loss or erectile dysfunction prescriptions. This tier costs an average of $93.